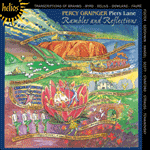 Grainger’s Tribute to Foster, based on Stephen Foster’s Camptown Races, was composed between 1913 and 1916. The Lullaby section for piano solo was worked out in the summer of 1915. Two years later Grainger recorded an improvised hand-played performance for the Duo-Art Pianola Company. Thereby, all the rhythmic complexities and irregularities of the improvisation could be preserved, as it were, photographically. Soon afterwards, Grainger was to notate this work for publication, reversing the accepted compositional process by transcribing it on to paper from the piano roll. The resulting piece is a free paraphrase of the central section of the main composition, and is a study in ‘musical glasses’ effect, making extensive use of what Grainger termed ‘woggle’—a fluttering right-hand tremolo. The effect becomes hallucinatory, and the listener is soon mesmerized by the beauty of the resulting soundscape produced by the quick repetition of notes over the main tune, which grows in intensity as the work progresses. Grainger tells us that the ideas behind the ‘lullaby’ section were coloured by memories of his mother singing him to sleep with Foster’s tune during his childhood. Grainger a basé son Tribute to Foster («Hommage à Foster»), composé entre 1913 et 1916, sur Camptown Races de Stephen Foster. La section de la Lullaby («Berceuse»), pour piano seul, date de l’été 1915. Deux ans plus tard, Grainger en enregistre une version improvisée pour la société Duo-Art Pianola, qui préserve, de manière quasi photographique, toute la complexité et toutes les irrégularités rythmiques de l’improvisation. Grainger couchera par écrit ce morceau peu de temps après, en vue de la publication, inversant le processus compositionnel habituel en le transcrivant à partir du rouleau de piano. La pièce qui en résulte est une paraphrase libre de la section centrale de la principale composition, et une étude des effets propres à l’harmonica de verres, faisant un usage intensif de ce que Grainger appelle «woggle» («tremblement»), consistant en un trémolo rapide à la main droite. L’effet en devient hallucinatoire et l’auditeur ne tarde pas à être captivé par la beauté du paysage sonore qui en résulte, produit par la répétition rapide de notes superposées au thème principal, croissant en intensité au fur et à mesure où l’œuvre progresse. Grainger a confié que les idées sous-tendant la section de la «berceuse» avaient été influencées par le souvenir de sa mère lui chantant la mélodie de Foster pour l’endormir, lorsqu’il était enfant. Grainger komponierte seinen Tribute to Foster, der auf Stephen Fosters Camptown Races fußt, zwischen 1913 und 1916. Der Lullaby-Teil wurde im Sommer 1915 ausgearbeitet. Zwei Jahre später nahm Grainger eine improvisierte Version für die Duo-Art Pianola Company auf. Dadurch konnten alle rhythmischen Komplexitäten und Unregelmäßigkeiten der Improvisation sozusagen fotografisch konserviert werden. Um das Werk veröffentlichen zu können, notierte Grainger es kurz danach indem er den normalen kompositorischen Prozess quasi umkehrte und die Noten von der Klavierwalze transkribierte. Das sich daraus ergebende Stück ist eine freie Paraphrase des zentralen Teils der Hauptkomposition und experimentiert mit dem Effekt „musikalischer Gläser“. Dies äußert sich in häufigen „woggle“—Graingers Bezeichnung für ein flatterndes Tremolo der rechten Hand. Der Effekt ist fast halluzinatorisch und der Hörer wird bald von der Schönheit der Klanglandschaft hypnotisiert, die im Laufe des Werks immer intensiver wird. Eine besondere Rolle spielen hierbei die schnellen Tonrepetitionen über der Hauptmelodie. Grainger merkt an, dass die Ideen hinter dem „Schlaflied“-Teil von den Erinnerungen beeinflusst wurden, wie seine Mutter ihn in seiner Kindheit mit der Melodie Fosters in den Schlaf gesungen hatte.